Leaving Wyoming, I stopped by Lake Tahoe for a week in early April. 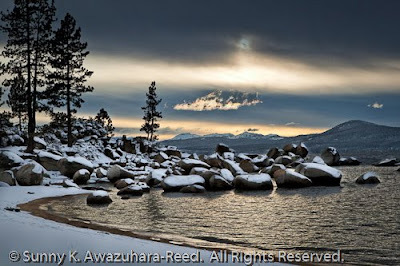 In addition to take care of several business/personal agenda, I was hoping to photograph some sunrise/sunset in the beautiful Lake Tahoe area... However, a storm was approaching when I arrived there... it began snowing hard that night, and continuously snowing for a whole week! Lake Tahoe was still winter... more than in Jackson Hole. Only one partly sunny day for entire week! 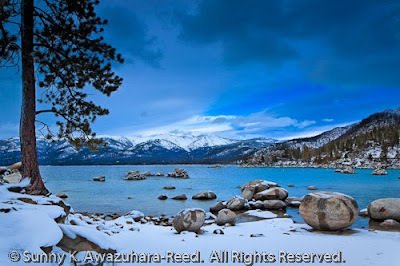 Didn't want to miss the opportunity, I was heading to Sand Harbor; one of my favorite spots in Tahoe, to shoot sunset. It was the late afternoon, golden sunshine came through the thin clouds. The lake was glimmering in gold! The round rocks on the shore was blanketed with snow. 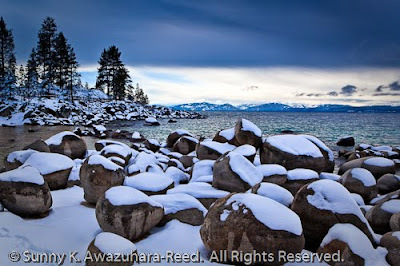 I just love the winter scene in Tahoe. There wasn't spectacular sunset but I was happy to see beautiful light in Tahoe. I had stopped by Black Pearl Gallery, which has been representing my fine art photo prints since 2008. It was a short trip, and back to Seattle where already spring and green. I've been working on several hundreds of photos from Wyoming and getting ready for new adventure in Alaska for coming summer. 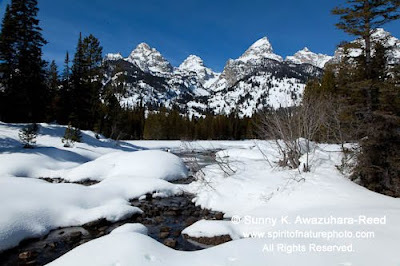 In mid March, it is already spring in Grand Teton National Park this year. 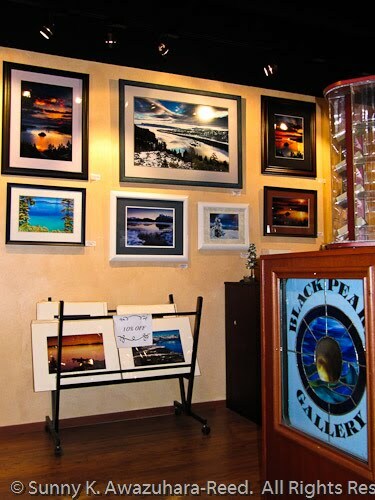 Snow began melting in the valley, and water began running down creeks… There is plenty sunshine everywhere! 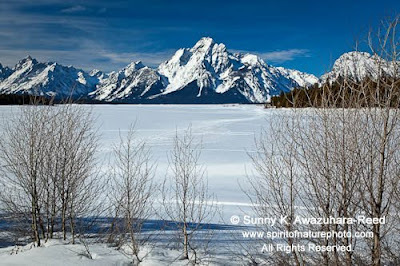 The large Jackson Lake in the Park is still solid frozen at this time of the year. 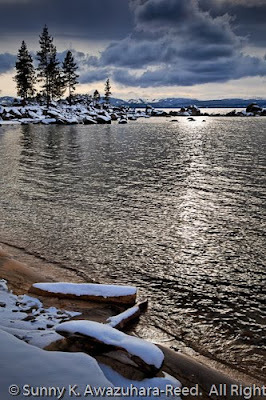 Snowshoeing cross the lake and exploring coves and islands are the only experiences left of this winter. 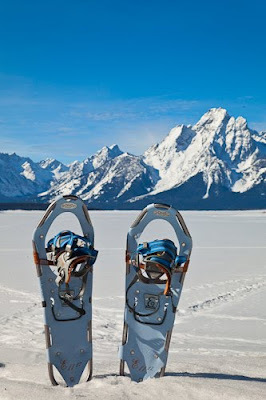 Many other smaller lakes along the valley can be explored with snowshoeing or cross country skiing. 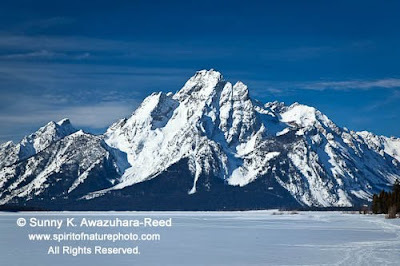 Taggard Lake and Bradley Lake are right under the base of the Tetons. 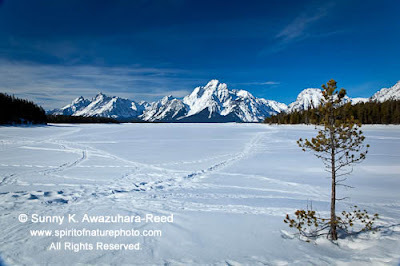 These lakes would have perfect reflections of the Tetons during summer. Creeks connecting the lakes were slowly melting… and bears already woke up at this time. 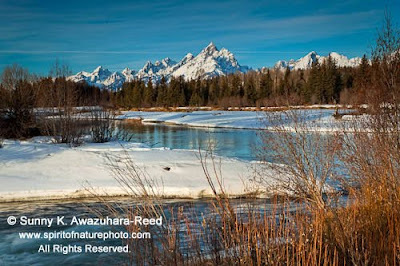 One of my favorite spots; Tetons and Snake River.